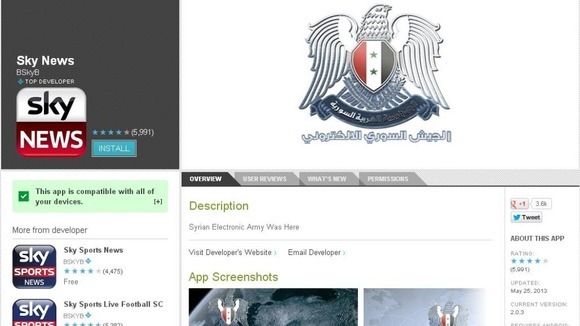 Sky News seems to have a habit of letting its credentials escape into the outside world, apparently letting the Syrian Electronic Army get its paws on its Google Play admin account. As a result, it's had the embarrassment of having the Sky News app screenshots in Google Play replaced with an announcement that “The Syrian Electronic Army Was Here”. To rub salt into the wound, the company's help desk Twitter account was also taken over to send out a message stating “Both Sky+ and SkyNews Android apps were replace, please uninstall”. However, that claim may have exaggerated the extent of the attack, since it seems more likely at this stage to be a case of the SEA putting its graffiti on the Google Play store page for the Sky News apps. The account takeover also included redirecting the developer help e-mail account to the SEA. It's not the first time Sky News has been embarrassed by being careless with security. Earlier in May 2013, one of its Twitter accounts was compromised to post “Colin was here”. In 2009, a Web petition being run by the broadcaster was defaced.